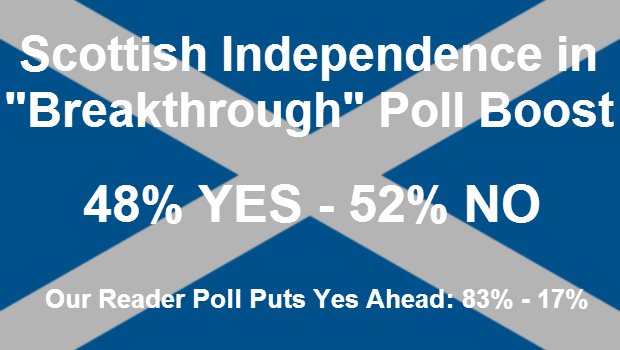 The Yes side in the Scottish independence are making significant progress toward their goal, with just over three months to go until the vote in September, if the latest opinion poll by Panelbase is to be believed. It has been obvious for several months now that the Yes campaign has been closing the initial poll lead enjoyed by the No campaign, steadily eating away at the level of the majority. Worryingly for the No campaign, the poll also showed that 34% of people who voted for Labour at the last Scottish Parliament election are now minded to vote Yes to independence. This appears to show that the attempts to falsely paint the referendum as just being about Alex Salmond or the SNP are falling on a not insubstantial number of deaf ears. There are a growing number of Labour Party stalwarts coming out for Yes, amid rumours of vigorous efforts to prevent many more from doing so. It will be interesting to see who is the first really well-known Labour Party figure to break ranks with the party leadership. That there is poll movement to Yes is clearly down to the work that is going on all over Scotland. A cursory look at the Yes Scotland website reveals events the length and breadth of the country while a similar look at the No campaign website reveals various “events” which are merely short leaflet runs rather than the scale of public engagement being undertaken by local Yes groups nation wide. Blair Jenkins Chief Executive of Yes Scotland commented: “The Panelbase poll is a breakthrough, putting support for Yes at a campaign high – it shows that our message that only with independence can the wealth of Scotland work for all the people is getting through. A further question in this opinion poll focused on what would happen if people believed that the Conservatives would form the next Westminster government then 55% would be likely to vote for independence. This comes as a separate UK-wide Guardian/ICM poll put the Conservatives two percentage points ahead of Labour for the first time in two years in the race for the 2015 UK General Election. Our reader poll has now closed, with 1,001 votes cast. Yes won this convincingly with 83% of the vote (828) to No’s 17% (173). This is around the same sampling number as used in national opinion polls but obviously it is far more self-selecting with those who have strong opinions either way far more likely to vote.